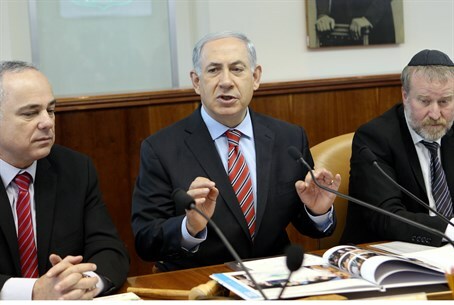 MainAll NewsInside IsraelBasic Law to Define Israel as Jewish Nation-State? Basic Law to Define Israel as Jewish Nation-State? Bibi calls out those who use 'demographic threat' to urge concessions in Judea-Samaria, but oppose defining Israel as Jewish. The move is not meant to undermine or threaten non-Jewish minorities within Israel, whose own rights are also enshrined in Israel's Declaration of Independence, Netanyahu emphasized. He also commented on the irony of the fact that many of those attacking efforts to define Israel as a Jewish state are the very same voices who call on Israel to make massive territorial concessions and implement a "two-state solution" with the Palestinian Authority – supposedly in the name of preserving Israel's "Jewish character". "I find it astonishing that among those who call on Israel to make concessions in Judea and Samaria due to the self-evident desire to avoid a binational state, there are those who oppose defining the State of Israel as the national state of the Jewish People. "One cannot favor the establishment of a Palestinian national state in order to maintain the Jewish character of the State of Israel and – at the same time – oppose recognizing that the State of Israel as the national state of the Jewish People. Supporting the establishment of a Palestinian national state and opposing the recognition of the Jewish national state undermines – over the long-term – the State of Israel's very right to exist." One of the key opponents to defining Israel as a Jewish state is Palestinian Authority chairman Mahmoud Abbas, whose refusal to acknowledge Israel as such helped derail US-brokered peace talks. Netanyahu has long challenged Abbas to do so, and many Israeli officials point to the PA chief's failure to do so as further proof that even with a negotiated two-state solution the PA leadership would not drop its claims to the rest of Israel.